For us as Christians, we must use every opportunity to re-awaken our hearts to the high price paid for our spiritual freedom. Jesus' coming, his life, and his death all testify to God's incredible and sacrificial love to purchase us from law keeping, sin, and death. We shouldn't be surprised by the apostle Paul's biting, sharp-penned, and urgent pleadings in his letter to the Galatians to hold on to their freedom. Two great dangerous temptations to go back to slavery have consistently confronted Jesus' followers. The first is law keeping as the basis of righteousness. This is sometimes called legalism. This is not to be confused with Christian obedience, which arises out of our sense of love and appreciation for the salvation given us by grace. Law keeping becomes our way of identifying ourselves as better, more saved, more holy, and more righteous than others. The problem with law keeping, Paul told the Galatians, is that if you break any law, then you are a lawbreaker, guilty of all the law. While the Old Testament Law was good and holy in that it pointed to the character God was seeking in the lives of his people, the law could only help us see how we failed to measure up to God's holiness. We needed a Savior to pay for our sin and empower us to a new way of life. This new way of life is the way of the Spirit, not the written code, and is built on the righteousness of Jesus Christ (Romans 8:1; 2 Corinthians 3:1-18). To go back to trying to justify ourselves by keeping the Law, any law, is to fall from grace and abandon the justification that comes only through the sacrifice of Christ (Galatians 5:4). Paul went ballistic with those who were trying to make law keeping the basis of their Christian faith in the book of Galatians. Let's not give up our spiritual freedom for any reason. However, the second form of slavery is to simply say that we are saved by grace and then get caught up again in immoral and unrighteous living. If the first form of slavery is called legalism, the second is called license. Jude warned about such teaching and such people (Jude 1:4). While doing what our desires lead us to do seems like freedom, it is actually another form of slavery. Jesus warned that if we sin, then we become a slave to that sin (John 8:34). He came to liberate from sin — not just our past sin, but from a life of sin in the here and now. We must not think we can go on recklessly sinning and nonchalantly depending on grace to cover our sin (Romans 6:1-2). In fact, when the Spirit is at work in us, the power of sin is broken (Romans 6:11-14) and the fruit of God's character comes to life in us (Galatians 5:22-26). To go back to our old sin, Peter warns, is like a dog returning to its own vomit (2 Peter 2:22). For me, one way to understand the differences between grace, license, and legalism is to look at a kite. A kite may decide it wants to be free, not bound by a string, but free to go anywhere the wind takes it. After all, isn't this true freedom? The problem is, a kite can't sail or soar without the string that ties it to the kite master. Instead, it is at the mercy of the wind, blown in whatever direction any ill wind wants to take it. It will not rise to the skies, but instead it will be bounced along the ground, torn by all sorts of obstacles until it is destroyed or shoved under a mound of wind-blown debris. At the same time, legalism can be understood as trying to fly a kite without the kind wind. We can try all we want to make the kite fly and soar; but the bottom line, any flight is temporary — we are not strong enough and fast enough to keep it in flight by ourselves. Sure, the kite is tethered to the kite master's will, but the string isn't really held by the true Kite Master, but by us and our desires to define ourselves as better than others. When all is right in the world of kites, the true Kite Master lets the kite rise on the power of the kind wind. It soars, dips, sways, rises, and falls with great elegance and freedom, yet it is kept from danger and disaster by the true Kite Master's careful influence and care. The string ties the kite to the true Kite Master's care. 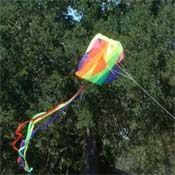 The kite is then free to be all it's supposed to be powered of the kind wind and the true Kite Master's loving control. If we understand the kind wind in this analogy to be the Spirit of God, the ill wind to be the desires of our flesh, the true Kite Master to be our Father in Heaven, and the string to be the link to the righteous will of God, then we get a glimpse of what God has made us to be in grace. The freedom we have in Jesus was purchased at a high price. That freedom is not just from the past life of sin that enslaved us to a life of degradation and death, but it is also to save us for a life of righteousness that displays the character and compassion of God. Let's not give up our spiritual freedom for any reason. Let's let God's Spirit help us soar in the freedom of grace while our lives display our Father's character and compassion. "For Freedom!" by Phil Ware is licensed under a Creative Commons License. Heartlight encourages you to share this material with others in church bulletins, personal emails, and other non-commercial uses. Please see our Usage Guidelines for more information.